The forecast calls for lots of snow during the 14th Annual Islamorada Chamber of Commerce Holiday Festival, set for December 7, from 5 – 9 p.m., at Founders Park. This year’s event, post Irma, will be moved to the beach inside Founders Park. 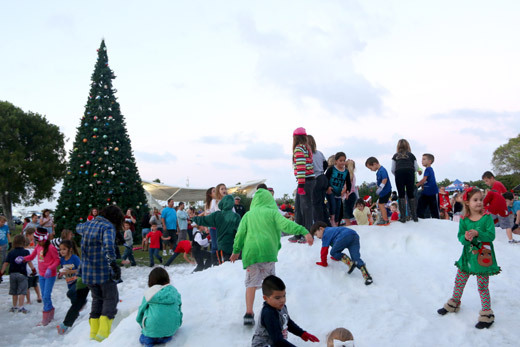 The event’s star attraction, the Holiday Festival Snow Mountain, will once again be made out of 30 tons of the cold white stuff—more than enough to delight mitten-clad children and some of their more playful parents too. Meanwhile, throughout the evening, Islamorada’s 35-foot high official holiday tree will be blowing magical snow through its branches. Snow is far from the only thing promised at Holiday Festival. At 7:30 p.m., the Holiday Parade will kick off, this year boasting the theme, “Silver & Gold.” Long-time Islamorada residents Ken and Dee Meeks will be this year’s Grand Marshals, and will lead the parade. Ken founded The Islamorada Bank (TIB) in 1974 and has been an important business and community supporter for decades. They will be followed by floats, antique cars and, of course, Santa himself. Returning to the Holiday Festival this year is Santa’s Sweet Shoppe, featuring a delectable selection of gourmet desserts and coffee. A wide variety of more savory food will also be on offer at the festival.